On November 15th, 1964 Johan Cruijff made his official debut in the Dutch league. Ajax lost in Groningen 3-1 to GVAV; Cruijff scored the only goal for Ajax. Nineteen years and six months later he plays his last match as a Feyenoord-player against FC Zwolle. He scored in his last match. Johan Cruijff played 48 internationals for Holland (33 goals) and was 34 times captain of the Dutch national team. With Johan Cruijff Ajax earned their place in football-history. In the early seventies they won three European Cups in a row: 1971, 1972 and 1973. When he returned to Amsterdam in 1981, he amazed the audience again. On December 6th, 1981 he fooled Haarlem-goalie Edward Metgod with a brilliant lob. With Cruijff Ajax won two more national championships. Cruijff started the 1973/74-campaign playing for Ajax but then moved to Barcelona. In Amsterdam, his teammates disappointed Cruijff by electing Piet Keizer to be captain. Besides, in Spain, he could sign a much better contract. Barcelona welcomed him as ‘El Salvador’. In his first year, Cruijff amazed the socios by leading Barcelona to their first national championship in 14 years. In Madrid, Barcelona humiliated Real by beating them 5-0. After his official retirement in 1978, Cruijff couldn’t resist playing again. Not only because of financial reasons but because he missed playing the game. Johan Cruyff moved to Los Angeles to play for the Aztecs. In the North American Soccer League Cruijff and is fellow football stars Pelé and Franz Beckenbauer tried to bring soccer to the Americans. After one year Johan Cruijff moved to the Washington Diplomats. At the end of the season, he was chosen American player of the year for the second time in a row. Cruyff returned to Spain in March 1981 to play for Levante, the second club in the city of Valencia. Levante, where Cruyff’s role model Faas Wilkes played in the past, could not meet the financial agreements. 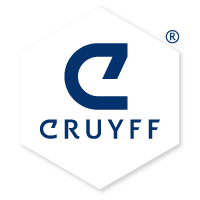 Cruyff played exactly ten matches and then quit. Driven by anger, Johan Cruijff did the unthinkable in 1983. He moved form Ajax to rivals Feyenoord. Supporters in Rotterdam were not too keen on Cruijff defending their colours, but their scepticism soon vanished. Notwithstanding an 8-2 defeat in Amsterdam against Ajax, Feyenoord took the national title and the KNVB Cup. Thanks to an impressive Peter Houtman, a dynamic Ruud Gullit but above all an inspired Johan Cruyff.